I can now say that it's now officially fall, because I've made my first batch of chili for the season! I certainly have a few recipes that are favorites, but I'm always looking for new and fun variations. I think I already have a list of 10 new chili recipes I want to try this fall and winter. 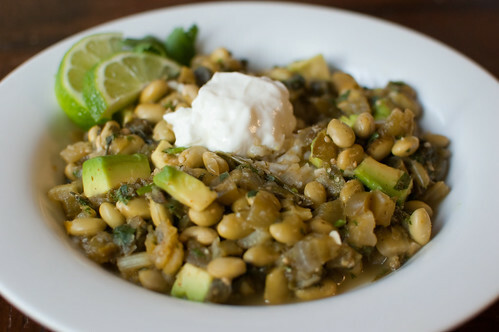 But first up for the year was this vegetarian green chili I came across in this month's Better Homes and Gardens. I was actually a bit skeptical about it, but it is loaded with veggies and I was intrigued by the combination of ingredients. Plus, it uses salsa verde, which is pretty much my favorite thing ever. I would have never thought to use edamame as the beans in chili, but surprisingly, it worked! They had a bit more bite to them than other beans, so it made for a textural contrast with the other ingredients. I served this over rice, but it would also be great over quinoa, tortilla chips, or crumbled cornbread. I know some of the ingredients may seem nontraditional or weird, but it all really works together, and this chili will definitely be making another appearance this fall. In a Dutch oven, heat the oil over medium heat. Add the green onions and cook, stirring constantly, for 2 minutes. Add the peppers and celery, and cook 5 minutes, until crisp-tender. Stir in the garlic, cumin, chile powder, and 1/2 tsp salt and cook until fragrant about one minute. Add the edamame and and green chiles and cook 5 minutes. Stir in the broth and salsa verde, and bring to a boil. Reduce heat and simmer, covered, 15 minutes. Stir in the spinach and cook until wilted, about 1 minute. Remove from heat and stir in 1/4 cup of cilantro and 2 of the avocados. Ladle into bowls with rice, and top with the yogurt and the remaining cilantro and avocado. Serve with lime wedges. I just made my first batch of chili tonight. This one sounds so interesting! I'm bookmarking it to try. I made a dish like this recently, but it didn't look near as good as yours! Next week I am going to try out this version to compare! This looks delicious and so healthy, thanks for a yummy recipe for fall! How fabulous! I haven't seen anything like this, can't wait to make it! Yum! I love the sound of this chili. I've never seen anything like this before! Love it. Always looking for recipes that we carnivores and my vegan nieces might enjoy. Looking forward to trying this. Looks fantastic! Love chili and Fall!! This was just the inspiration I needed yesterday morning and I made it for dinner last night. :) My husband and I both enjoyed it...although mine was not nearly as pretty as yours! Thank you for the recipe. Work is hosting a chili cook off later this month. It's going to be a tough decision between entering this chili and last fall's Pork and Chorizo chili. Both look delicious! I made the BH&G recipe and found that their cooking times were too long for vegetables like the peppers and celery. I like mine to not be mushy! Also, quinoa makes a great substitution for the rice. i made this chili tonight....all I can say is YUM! The flavors were so bright and fresh. My family enjoyed it. Thanks for sharing the recipe. 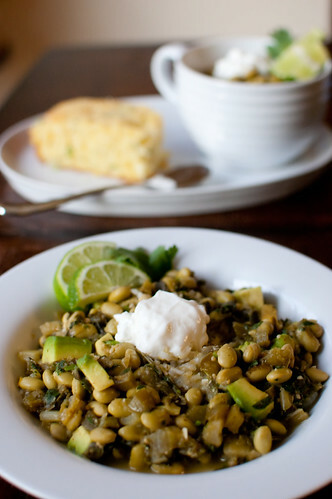 This chili sounds great - I love that you used edamame instead the usual type of beans.